44 | TH E M R EP O RT SERVICING THE LATEST O R I G I NAT I O N S E R V I C I N G DATA G O V E R N M E N T S E C O N DA R Y M A R K E T CFPB: Servicers Fail to Protect Borrowers A bureau report calls attention to several failings amongst mortgage and student loan servicers. T hrough its supervisory activities, the Consumer Financial Protection Bu- reau has determined that some mortgage servicers are failing to provide adequate legal protec- tion to struggling borrowers and have therefore violated the law. According to the bureau's Supervisory Highlights report released in May, CFPB examiners also found that some servicers mishandled escrow accounts, kept borrowers in the dark about their potential foreclosure prevention options, prematurely entered the foreclosure process, and sent incomplete bills and statements. CFPB examiners found similar problems with several student loan servicers as well, stating that many had "failed to refund charges im - posed on borrowers who had been wrongly denied the right to defer payments while enrolled in school." "We found that some mortgage and student loan servicers are violating the law by failing to provide protections to borrowers," CFPB Director Richard Cordray said. "Their slipshod practices are putting borrowers at risk of financial failure, and we will hold them accountable." According to a CFPB release, the bureau's non public supervi - sory activities have also recovered more than $6 million for consum- ers ill-served by car lenders, $19 million in civil money penalties, and $39 million in total consumer remediation. The activities also led to five public enforcement actions. Servicers with whom CFPB examiners found issues with will be alerted and informed of potential remedial measures. According to the bureau, this could include issuing refunds, paying restitution, implementing policies, improving training, increasing monitoring, and other actions to stop illegal practices. 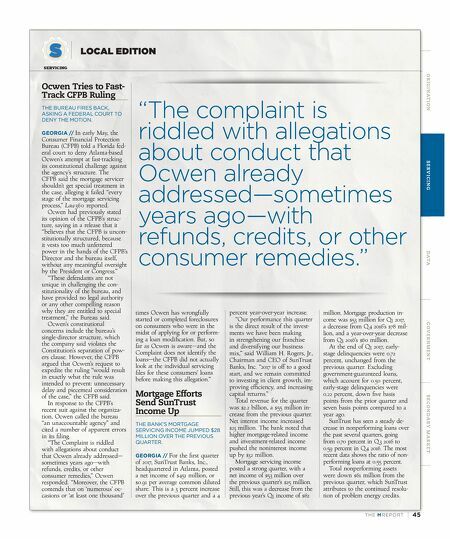 The CFPB recently filed suit against Ocwen Financial Corporation, alleging it "engaged in significant and system misconduct at nearly every stage of the mort - gage servicing process." Ocwen responded by filing three motions with the court, hoping to expedite a ruling on the constitutionality of the CFPB itself. "Ocwen believes that the CFPB is unconstitutionally structured be - cause it vests too much unfettered power in the hands of the CFPB's Director and the bureau itself, without any meaningful oversight by the President or Congress," a release from Ocwen stated. The CFPB's Supervisory Highlights report covered CFPB supervisory activities from September to December 2016. Assessing RESPA As required by the Dodd-Frank Act, the bureau must review rules five years after they take effect. T he Consumer Finan- cial Protection Bureau (CFPB) is planning to assess the effectiveness of the Real Estate Settlement Pro - cedures Act (RESPA) mortgage servicing rule. The rule, intro- duced in January 2013, took effect in January 2014. It was designed to assist consumers who were behind on mortgage payments. Among other things, the RESPA mortgage servicing rule requires servicers to follow certain procedures related to loss mitigation applications and communications with borrowers. Servicers must give in writing notices of error within five days and investigate and respond to the borrowers within 30 days. Additionally, the RESPA mort - gage servicing rule calls for greater transparency between the servicer and the borrower. It requires clear monthly mortgage statements, asks servicers to provide early warning before adjusting interest rates, and gives options to avoid force-placed insurance. "For many borrowers, dealing with mortgage servicers has meant unwelcome surprises and constantly getting the runaround. In too many cases, it has led to unnecessary foreclosures," CFPB Director Richard Cordray said of the rule in 2013. "Our rules ensure fair treatment for all borrowers and establish strong protections for those struggling to save their homes." The Dodd-Frank Act requires the CFPB to review their rules five years after they take ef - fect, and this includes RESPA. Currently, the bureau is seeking comment from consumers, con- sumer advocates, housing coun- selors, mortgage loan servicers, industry representatives, and the general public regarding the rule and will issue a report of their assessment by January 2019. 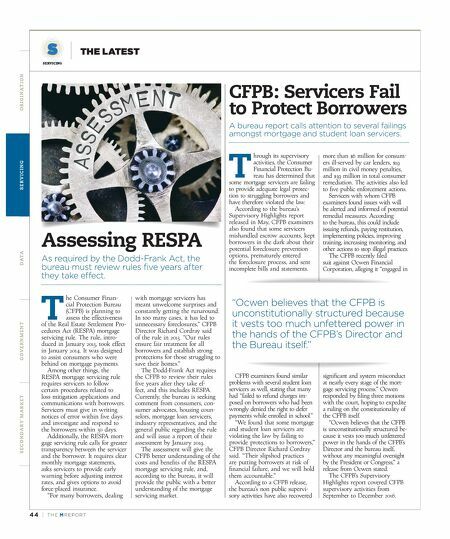 The assessment will give the CFPB better understanding of the costs and benefits of the RESPA mortgage servicing rule, and, according to the bureau, it will provide the public with a better understanding of the mortgage servicing market. "Ocwen believes that the CFPB is unconstitutionally structured because it vests too much unfettered power in the hands of the CFPB's Director and the Bureau itself."